It might all be thanks to his stylist but Armie Hammer is one of the few men in the spotlight who seems to care about fashion. He always looks occasion-approriate, elegant and manly and he does so without being repetitive and abusing the classic combo of dark suit and light shirt. This week he started out strong in a custom-made red Gucci suit, which he wore with a white shirt and brown tie. He could have only been more unorthodox had he worn light shoes. 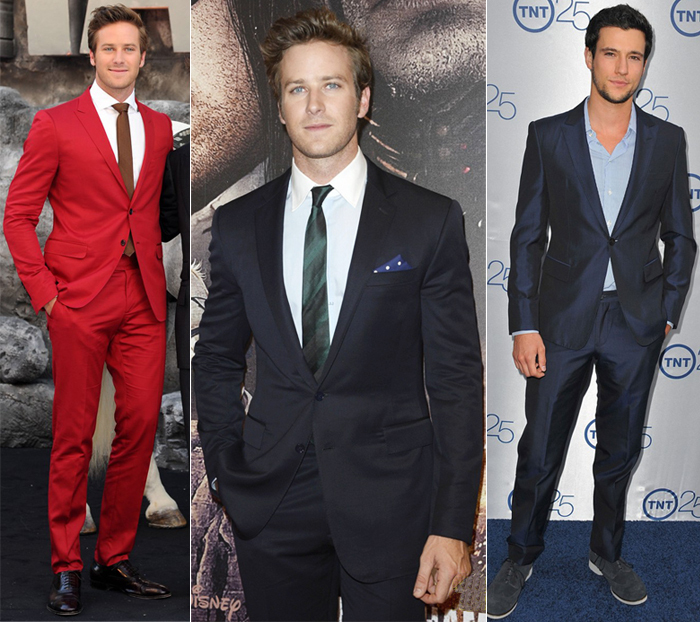 It's hard to pull of a colour like this and it's undeniable that Armie absolutely rocked it. Later on in the week he went for a more subtle choice in a navy Ralph Lauren Black Label suit paired with a light blue shirt featuring a white collar, a striped green tie and a polka dot pocket square. 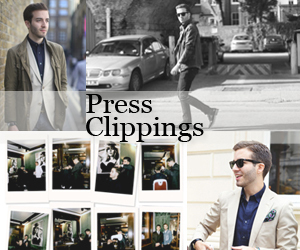 This was a lesson on how to do classic tailoring using accessories to give it personality. If, like me, you're a fan of 'Falling Skies' you will recognise Drew Roy from playing Hal Mason in the TV show. The actor attended an event this week in a blue suit worn with an oxford blue shirt and grey suede brogues. Other than the great fit, this look works because it's smart but relaxed, mostly thanks to the undone shirt and unexpected shoe choice. It's nice to see Joe Jonas ditching the jeans and t-shirt LA look for a much more elegant and cooler outfit to take his girlfriend for dinner. The singer donned a dark chambray suit worn with a classic black shirt and black sneakers, for a casual touch. Logan Lerman is currently promoting his latest film. For his stop at Giffoni Film Festival the actor wore a lightweight striped knit jumper with navy chinos and deck shoes. He always looks on-point without a trace of effort. In abstract, tattooed arms, a grown un-groomed beard and a shirt-sleeved shirt is no one's go-to look for the summer. And somehow all of these elements combined look pretty damn cool on Adam Levine. I am especially loving the printed shirt – cuban shirt, anyone? – which mainly works thanks to the scruffy facial hair that adds a tough vibe.